The 30th Birthday Bash for the Treehugger's Ball, People's Climate March Rally and the bird walk occur April 28-29-30 in Huntington. -Friday, April 28: It’s the Treehuggers’ Ball! Begins at 6 p.m. with a picnic on the patio at the V-Club in Huntington. Details on Facebook and here.We all work hard to protect our environment and our future. This is an opportunity for us to celebrate our community and get to know each other better! 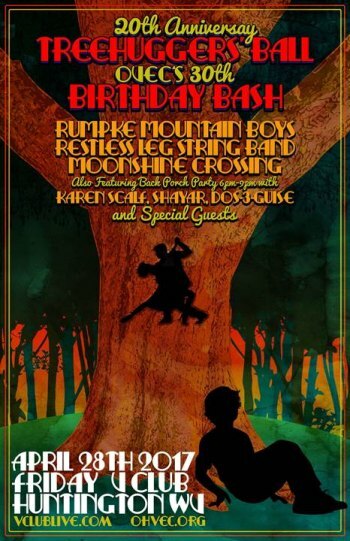 Music by Rumpke Mountain Boys and many more. Cover is $15. -Saturday, April 29: Peoples Climate March Sister March and Rally in Huntington. See our media advisory or blog or Facebook invite for all the details.Bring a sign and some friends. If you can’t make it to Huntington, there’s probably a Peoples Climate March near you.Enter your zip code here to find a nearby march.